Remember when you swooned in the theater as the old-lady version of Rose in Titanic said farewell to her true love and tossed her jewel necklace into the ocean? Yeah, we don’t either, but apparently a lot of other people did. Movie paraphernalia can be worth its weight in dollar bills, depending on the success of the film, and no picture has been as successful as the all-time box-office champ Titanic. 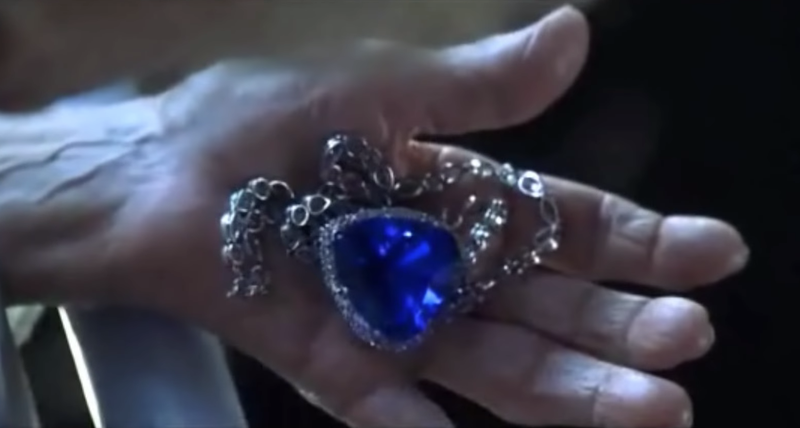 But, as explained in a new story by Racked, the Heart Of The Ocean necklace, worn by Kate Winslet in the film, partially helped bring about the bankruptcy of the company that licensed it for commercial reproduction and sale. John Peterman, founder of retailer J. Peterman Company, explains that his business—which is is based on “authentic reproductions of vintage clothing, accessories, and home décor” (and yes, we’re a little confused by the phrase “authentic reproduction,” too)—decided to get in on the action of the then-upcoming picture. “Someone in the company said, ‘I know this movie, Titanic, is coming up. It’s a period movie, and the same kind of stuff we always do. We should have a deal with them!” Peterman tells Racked. They struck a deal to buy some of the actual props from the film, including the necklace, and license all of it for reproduction and sale. “This was the first time that had ever been done,” he adds, “and we ruined it for everyone else—because suddenly, [the studio] realized those props had value.” J. Peterman Company ended up selling more than a million dollars’ worth of Heart Of The Ocean replicas at $198 a pop. Unfortunately, someone at the company didn’t seem to understand that a film’s popularity doesn’t just carry on at the same degree of intensity forever more. Spurred in large part by the financial windfall, J. Peterman Company secured a bunch of venture capital, opened 10 new brick-and-mortar stores in 1998, and underwent massive expansion. Then Titanic did what movies do—it went away—and J. Peterman collapsed under the weight of it own ambition. The business filed for Chapter 11 the very next year, and was bought by Paul Harris Stores. But John Peterman won out in the end: Paul Harris Stores went bankrupt itself in 2000, and he raised enough money to buy back his brand name. As a result, you can still order things from the J. Peterman catalog today—though not the Heart Of The Necklace diamonds, which now go for around $400 on eBay. The original pendant was sold during the first bankruptcy. Peterman has no idea who owns it. However, if you’re reading this, and are the one in possession of it, The A.V. Club would like to make a bid for it. We have $198 and some lovely DVDs lying around the office. Let’s make a deal.